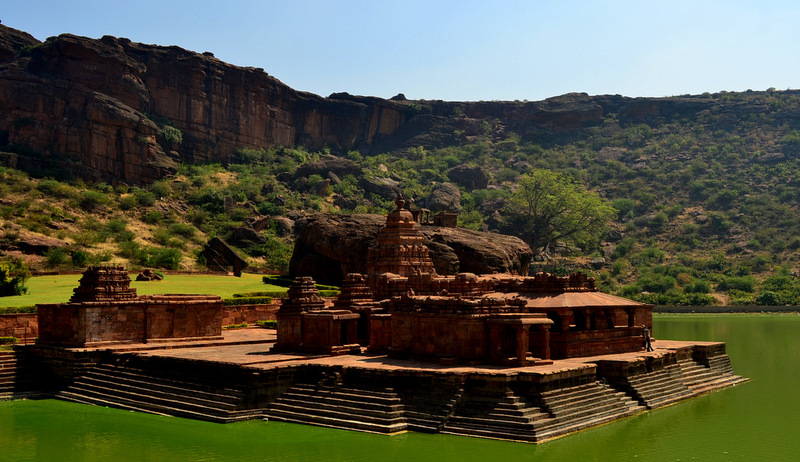 Apogee it truly is, for Pattadakal is one of the most beautiful sites in Karnataka’s rich heritage. Spend some moments in quiet solitude and you can almost hear the stones whisper stories about the kings and their victories of yore. As for me, all I could hear were the collective shrieks from the school children who seemed to have an itinerary similar to ours. One of the kids walking past. I thought his school uniform brought a dash of the sky blue to the lower half of the photograph as well ! Right outside the temple compound, we found a shop selling hot mirchi pakodas (a special chilly, de-seeded to remove the acidic taste and dipped in gram flour and then fried). Delicious was not quite the word that came to my mind, for street food even in some of India’s remotest corners has an amazing variety of tastes that can take time to sink in, in the first bite and only later, can light up your senses like a christmas tree. We devoured a few plates along with some spicy coconut chutney and some sweet tea to wash everything down. Aihole, our next destination was some 14-15 kilometres from Pattadakal and there was about an hour to go before sunset when we reached there. As mentioned above in the unesco description, the ‘laboratory’ or the ‘cradle of temple architecture’ epithets come from the fact that it was here that the skills of the Chalukyan architects were honed. The durga temple at Aihole (crowded again, with too many school kids) was the first sight to greet us. 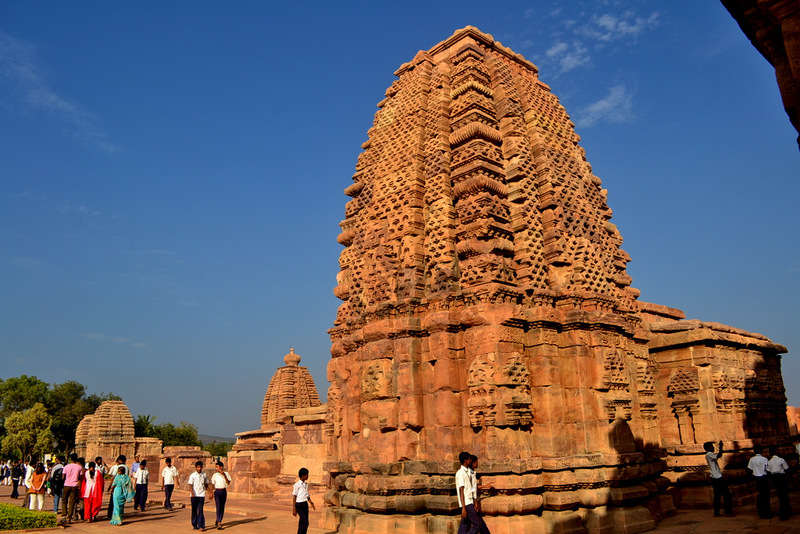 If we had done our research on Aihole well, we would have known that there were about 125 temples in Aihole instead of the solitary few that greeted us inside the compound. Having said that, here is an interesting wiki article if you want to read about the architectural style of Hindu temples. Excavations were going on at quite a few places inside the compound and we would have loved to talk to the excavators and find out more, but since it was getting dark fast, we could not afford to spend more time and had to hurry back to Bagalkot. There are not many buses that run directly to Bijapur from Bagalkot and it is advisable to check at the bus station. If I remember correctly, it was around 8.15 or 8.30 that the last bus was scheduled to depart and we got there well in advance, which meant that dinner would have to wait until we reached Bijapur. It was around 10.30 by the time we reached Bijapur. Dinner was foremost on our minds and we scouted around till we reached this nondescript place called Everest hotel. There, 15 huge chapatis, 3 curries (including a non-vegetarian dish) cost us a total sum of around 240 Rupees. If that is not value for money, in 2012, I don’t know what is.